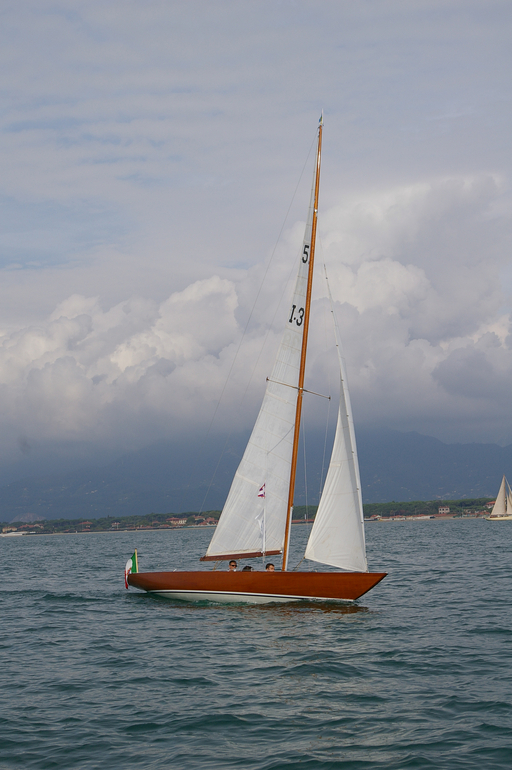 The restoration of Violetta VI, a 5.50 built by Cantieri Navali Baglietto in 1962 and designed by Giulio Cesare Carcano was completed end of November 2003. Violetta VI won the Coppa d'Italia in 1962. Alessandro Baldi bought her almost 2 years ago in Italy. She was in bad shape after having been abandoned for 25 years in a shipyard! The keel was detached, the keel bolts were inspected, some mending was made to the hull, the original fittings were all re-chromed, and the mast, boom, deck and finally the hull were freshly painted. The restoration has been magistrally executed by Cantieri Pezzini in Viareggio Italy. Her proud owner has a complete and detailed documentation about the restoration and would be happy to share it with whoever is interested. The boat will be launched in spring 2004. Commessa 5968, 8 Novembre 1961. Note from Alessandr Baldi.